Silas Decker is a vampire more than three centuries old, and finding it increasingly hard to keep rebuilding his life as people die and the world keeps changing. Living alone with no friends and few acquaintances, he sees less and less reason to keep trying. Eloise is a Virtue, a soldier of God against evil. She's made being that soldier the only thing she is, lest human connections weaken her. 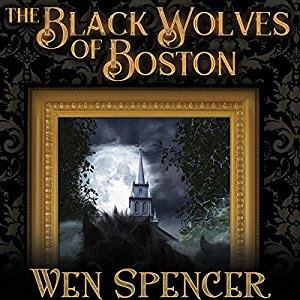 Seth is the sixteen-year-old Prince of Boston, a werewolf, the only survivor of his murdered family. His only living close relative is his cousin Jack, and the Wolf King, Alexander, is keeping Seth in New York, not letting him return to Boston for reasons he doesn't clearly explain. And then there's Joshua, an ordinary college-bound high school student in small town, upstate New York, working hard to make his high school transcript look impressive for the colleges he wants to apply to. As part of that plan, he volunteers for the prom committee--and one awful Friday night, he finds himself badly hurt and covered in blood, with the rest of the prom committee dead and torn to pieces around him. Traumatized by events and further confused by a dream, or vision, or perhaps just a conversation, he had while undergoing an MRI, Joshua runs away to Boston, seeking someone he hopes will help him understand what's happened to him. Because Joshua is now a werewolf, too. This is a well-thought-out fantasy world, that makes good internal sense. It has action. It has great characters, who discover they need each other. It has a plot that really works. It's also a novel set in Boston, at least to a significant degree, which does not contain the errors about Boston that kick one out of the story if one actually knows the city. I have a little list of otherwise very good writers who think they know Boston because they've studied maps and, perhaps, stayed awake in history class. (A hint I suspect applies to any geographic area: Before you use the official, found on a map name of a road in a story, check out whether that's what people who live in the area actually call it. Especially if it's a state highway running through multiple towns and counties.) Avoiding those mistakes adds a layer of reality and believability that strengthens a fantastical story. If you are using a real place in your story, and it's not a place you know intimately, check your details. All of them! Because yes, readers will notice. But even more important than avoiding those dumb errors, which will after all only affect the readers who recognize them, is the fact that Spencer gets the characters right. Seth is affected by the trauma he experienced at thirteen, by the fact that he's the Prince of Boston and being educated that way, and has responsibilities--but also by the fact that he is, in the end, still only sixteen. Decker is lonely. Eloise has cute herself off emotionally and lived as a loner because she thinks it's the only way to do her job properly. Joshua, a year older than Seth, has not had either his emotional trauma or his education and training, and is in many ways younger. He's frightened and confused by what's happening to him. And these four people have to come together to combat a plot by Wickers, a faction of witches that practice human sacrifice to gain magical power, to destroy Boston. The plot, the characters, and the setting are developed convincingly and drew me in irresistibly. It's just one heck of a fun book.